The romantic artist Katharine Ellis; 2. Inventing Liszt�s life: early biography and autobiography Alexander Rehding; 3. Liszt in the twentieth century James Deaville; 4. Liszt's early and Weimar piano works Kenneth Hamilton; 5. Liszt's late piano works: a survey James M. Baker; 6. Liszt's late piano works: larger forms James M. Baker; 7. Liszt's piano concerti: a lost tradition Anna Celenza; 8. Performing Liszt�s piano music Kenneth Hamilton; 9. Liszt's Lieder Monika Hennemann; 10. Liszt's symphonic poems and symphonies Reeves Shulstad; 11. Liszt's sacred choral music Dolores Pesce. There has been a received wisdom about Liszt, dating from biographical material published during his lifetime, that he was, as man, performer and artist, a bundle of contradictions. In turn, it has been assumed that to understand Liszt in any of these roles it is important to come to grips with the nature of those contradictions. The result is that separating life from art is perhaps more difficult with Liszt than with any other major composer. The man who seriously studied Beethoven�s sonatas was also a competitive showman who would not be out-done by rival virtuosi; a man who prized religious devotion at the same time as engaging in a spectacular adulterous relationship; an avowed Hungarian nationalist who was in fact a non Hungarian-speaking cosmopolitan. The first three chapters come at the theme from different angles. A second theme is also hammered home: the fact that only a relatively small number of Liszt�s compositions were published after his death, and in modern times, little of it recorded. Even professed Liszt lovers may be ignorant of a large body of his work. This is beginning to change and tribute is paid, for example, to the pianist Leslie Howard who, after many years, has finished recording the whole of the piano music. The book is timely in that it is produced in the light of a number of such positive developments. The editor, Kenneth Hamilton of Birmingham University (UK), has impeccable credentials for he is a distinguished pianist, academic and Liszt specialist. One of his jobs, one assumes, would be to give guidelines to his writers � all but one of whom are North American based - about where to pitch their contributions. This is a difficult issue. I have always assumed the Cambridge series to be aiming at what might be described as the knowledgeable music-lover and the music student. Even that can be difficult to achieve because the "knowledgeable music-lover" is not necessarily someone who reads music, let alone knows their supertonic from a sub-mediant. How technical do you get? To my astonishment, Hamilton says in his editor�s preface that giving some guide to the contributors about who to aim at is not his job: "I see it as no part of an editor�s duty". So the fact that half the eight chapters on the music require some technical knowledge to get the best out of them and the other half do not is clearly an accident. Now if you are a reader who wants that kind of technical description, fine, but you may be frustrated by the fact that you will not get the great B minor Piano Sonata given the same treatment because it comes in Hamilton�s chapter and he is not aiming at you. (If Hamilton were challenged on this he might direct you to his book, published by Cambridge UP nine years ago, that is entirely devoted to the one work). I am not saying that the approach is wrong, just pointing to inconsistencies that a prospective buyer of the book needs to know. 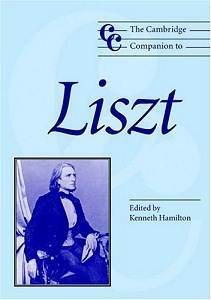 By the way, the Cambridge UP publicity on the book � and you can see this on their website � describes it as, "An up-to-date view of Liszt for the non-specialist", and on the back of the book you read that it is "available for general readership". You can make your own mind up about that. Having got that out of the way, I think that taken as a whole, for someone with technical knowledge, this book provides as comprehensive an insight into Liszt�s work as any that is available and, compared with Alan Walker�s majestic three-volume work on Liszt, admirably concise. For the layperson, nearly 70% of the book will be comprehensible, challenging and illuminating. And for pianists aspiring to play Liszt, there is some really fascinating and insightful material by Hamilton on interpretative matters and on piano style and technique of Liszt�s period. The book is highly authoritative, bang up to date with the latest Liszt scholarship, and there are lists, tables, notes and indices that provide excellent reference material, all nicely presented.